Big Brother Season 19 (BB19) continues on Day 58 when Season 16 winner, Derrick is the host of the Head of Household (HoH) competition. They will be playing Tale From Crypt. In each match 2 players will step up and watch while the cryptic clue is revealed, the faster they answer (which will be the name of an evicted house guest), the first person to hit the right clue will win and the other will be eliminated; but if they answer incorrectly, they are eliminated and their opponent will advance. The last player in the tournament will be the new HoH. For the first round it is Raven vs. Mark; Paul vs. Alex; Christmas vs. Kevin; Josh vs. Matt. Raven gets it right with Ramses and Mark is eliminated. Paul rings in Cody and Alex is eliminated. Christmas and Kevin are up next, he wishes her good luck and she blows him a kiss. Christmas picks Jillian and is correct meaning Kevin is eliminated. Josh and Matt are up; Josh rings in Jessica and wins, eliminating Matt. Round 2 begins with Raven vs. Paul, he pushes Cameron and eliminates Raven; she hugs him, worried about it being Big Brother and who can you really trust. Christmas vs. Josh is next; he tells her that she is going down. She rings Elena and is correct, Josh is out. Final round is Christmas vs Paul, she is desperate to win HoH; Paul says its a pivotal week but wants to know if he should win or hold off until next week’s HoH competition. He tosses it for Christmas, who won’t put him up. He knows the answer and he wants her to hit the right button so before she can botch it he answers incorrectly yo give Christmas the win and she is the new HoH. She’s thankful he threw the game for her but she insists this is still her week and is about to make a big move. Christmas feels rejuvenated and Josh is thrilled she won HoH, this week the plan is simple, make sure Mark doesn’t win the Power of Veto (PoV) and get him out of the house; he’s not giving up without a fight though. Alex thinks if they can’t get rid of Mark they should put Kevin up because his shady and was caught making side deals with Cody and plans to tell Alex to put him on her radar. When Alex and Christmas talk they both have the same thought that Kevin might be an undercover police officer. Kevin tries to talk in Alex in private and she walks away, saying she doesn’t want to talk to him. Alex talks to Jason in the pantry and Josh leaves when they start to talk about Kevin. Jason felt he could trust Kevin but he also wants the $500,000; Alex is his “ride or die” and he has to jump ship when it comes to his friendship with Kevin. 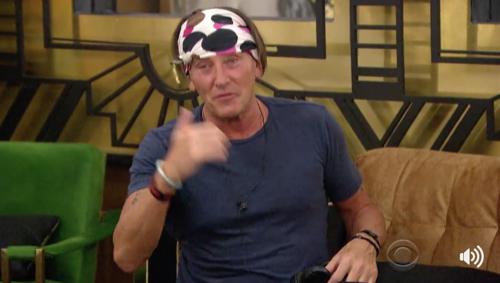 Jason talks to Kevin private and when Jason asks him about what he said to Alex and how she says he is a liar; Kevin furiously says he is going to confront her right now and things are going to get ugly. He tells Jason he didn’t do anything and now him and Alex are nothing. Kevin agrees that he knows how Alex gets. Jason wants Alex to relax and understand where Kevin is coming from and he wants Kevin to relax and stop aggravating Alex. Kevin wonders what he lied about this time. In the pantry Jason admits what he said to Alex and she tells him he is talking to much. Alex tells him not to say her name and involve her in stuff that he is going to confront her. She tells Jason that Kevin is a cop. Alex lies and tells Kevin to stop asking her questions because that is annoying and walks out. Jason lies and says there is nothing more as Paul walks in saying people get dramatic over stupid things and Jason assures him things are fine. Christmas and Josh talk in the HoH room, and he admits he is starting to believe that Jason and Alex did try to flip the house against Paul like Cody said as he left the BB house. Jason made a mistake admitting that Mark had him on the fence about getting Paul out. Jason whistles and calls everyone together in the BB house, asking who wants to see his HoH basket. He won’t get the HoH room because he won it during the double eviction but all he wanted was the basket, the letter and the pictures of his family. He cries as he reads the letter, as everyone tears up talking about his son and how he needs to win Big Brother because he is going to be a big brother as his wife is pregnant. He falls to the floor crying, finding out he is going to be a dad for the second time. He shows photos of his son and the ultrasound and now this is a driving factor to make big moves and win more than ever now! At the beginning, Josh was losing his mind and Christmas was the only one comforting him and caring for him and now he is being there for her. He makes her food and comes to see her, saying she is amazing even though she is struggling and is still a strong competitor. He feels she is a big sister for him and hopes they will be the final 2, they thank each other for standing by each other. Paul sit with Raven and Matt and they understand why he threw the HoH competition now. Paul says they need to get rid of the “what ifs” Kevin and Mark. Paul and Christmas meet in the HoH room, although she hears Kevin is sketchy she wants Mark to go. Plan B if Mark can’t go home, then Jason goes home, reminding him of the speech Jason said last week. She wants to put 1 person from the 2 showmances but wouldn’t feel bad if Jason goes home. Josh is losing it and talks to a stuffed owl, talking about all these meatballs. He says he is having a better time in the private room with the owl than outside with everyone else. Suddenly the TV lights up with the Tree of Temptation; there is a tree and a bunch of apples. Christmas announces the summer of temptation isn’t over yet because the tree of temptation has just sprung to life and will play for 3 weeks. The tree has 5 apples, inside each one is a power or a punishment. The moment the tree turns red, the first HG to go to the diary room and claim an apple will earn the right to select one apple from the tree; this will happen for a period of time before nominations but once a HG has chosen an apple they are not eligible to choose another. Once an apple is selected everyone will gather in the living room where it will be opened and it will be revealed what’s inside. On the tree is says 1. Save a friend. 2. Can’t play in next HoH. 3. Bounty on your head. 4. Eliminate 2 Eviction votes and 5. Second veto! This twist will change up the game 100%, Mark is very thankful for it; once the power or punishment is revealed it has to be used in that one week. The tree lights up and Mark heads to the diary room (DR) and says he would like to claim an apple. Everyone gathers in the living room where the holder will learn their fate. Mark opens the apple and it says “Save a Friend”. Christmas says her plan is to back door Mark, but she needs to have one of each of the power couples up as pawns. She talks to each of the HGs and says that if Mark wins veto, they are sending Jason home. Jason is oblivious to the plan as he trusts his alliance. Mark tries to convince Christmas and Josh to not put him up as he has respect for them and thanks Josh for allowing them to have a respectful conversation; he tells Christmas to consider the power he has now.